Did you know that sometimes a Clipa will fit under a counter that seems too thick at first glance? Many of these countertops are molded pieces that appear to be solid but are actually hollow. Here’s how to do it: open a Clipa and tuck it under the bottom of the counter first . Very often, it will fit. Tucking it up under the molding first sometimes gives you just the space you need. 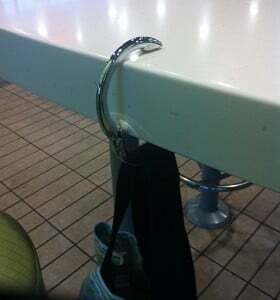 To take the world’s most versatile purse hanger off, simply reach under and tilt the Clipa out. This trick works on curved counters and many sinks too; discover other great uses by clicking on the image.